To use Pilvi Platform, you need to have a Profile on the Pilvi Platform Site you intend to use. Profile may be created by registering to the Site from the Sign up page, or by making an Order as a new Customer. When you have an Profile on the Pilvi Platform Site. You can login to the Platform using your email address and password. 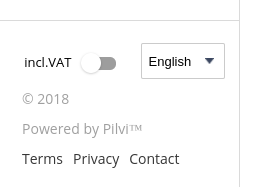 You can find the login form from the hover menu in the top right corner. Console Section login pilvi-platform-site-address/console/login redirects the User to Console front page. After login, you can switch between Shop and Console Sections from the top of the left side menu.